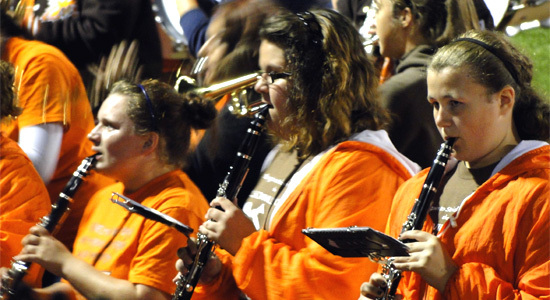 Tonight Sarah and the rest of the Nelsonville-York Middle School Band join the high school's band while performing at the varsity football game against Bishop Ready. The middle school's band helped out with a couple numbers throughout the evening during both the pre-game and halftime activities. Sarah really seems to be enjoying her time with the band. I watched from the stands with Mom, Jeff, Derek, Crissy and Jake. I'm glad Sarah is having such a good time and performing so well. I'm so proud of her. Nelsonville-York defeated the Bishop Ready Silver Knights 26-13. Go Bucks!